Since all things pineapple are super popular right now and we follow lots of tiki enthusiasts, carved pineapples have been popping up all over our social media feeds. Now that Halloween is right around the corner, we decided to give it a go ourselves. Some parts of our process were super successful and others were less so. Keep reading for some great tips on how to make the most of your carving experience especially since pineapples, as you may have guessed, are very different from pumpkins! You're going to need a big, sharp knife, a pineapple slicer & de-corer, a cutting board, and a smaller cutting tool like a steak knife. If you plan on eating your pineapple later, a container to hold all that juicy goodness is recommended as well. Let's also not forget about a tea light candle and something to light it with (ideally a long lighter since it's hard to reach the candle inside the pineapple). It's worth noting that Greg decided to carve his pineapple with a Dremel so we also had that on hand...but you may not want to go that route (more on that later). Using a nice, sharp knife, lay the pineapple on its side and cut the top off. It's best if you make this cut as even as possible so that the top of the pineapple sits nicely on top when you're all done and doesn't slide off. 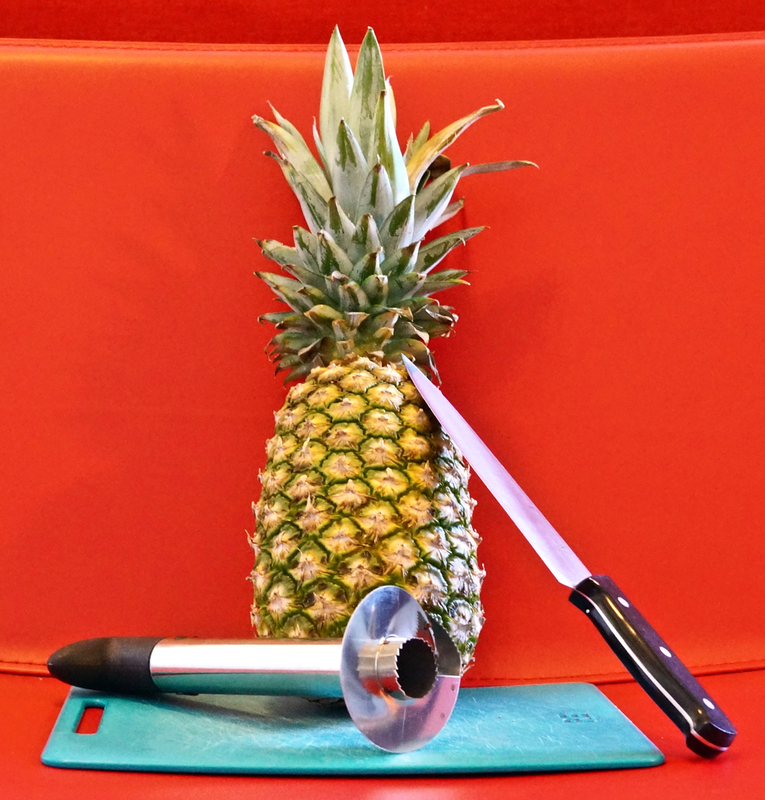 Then it's time to insert your pineapple slicer & de-corer. With the pineapple standing up, try to center it as much as possible. If it is too far to one side, that part of the pineapple may end up a little weak - not ideal for carving! Once it's inserted, twist it until you hit the pineapple bottom (it should be more difficult to turn at that point). 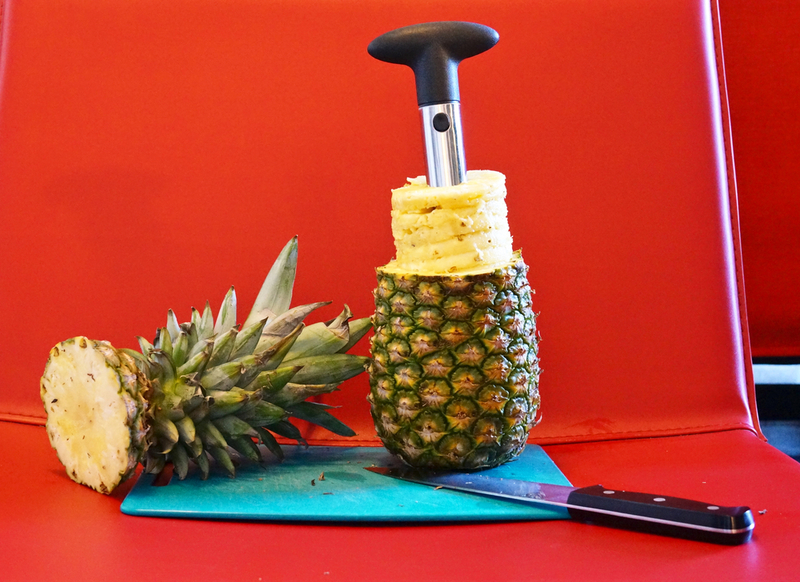 After you've sliced through your pineapple, pull up on your slicer & de-corer to pull out the majority of the juicy insides. Store the sliced pineapple in a container for later if you plan on eating it (we have a great recipe lined up for ours). Once you've removed the majority of the insides of your pineapple, you're going to be left with a portion in the center. Use a knife to cut this portion out and make sure that the bottom of the pineapple is relatively flat so that a tea light candle can rest on it when you're all done. If you're tired of scooping and scraping out pumpkin guts year after year, I'm sure you'll be happy to go through this much easier process to prep a pineapple for carving! Ok, so this is the part where we really learned a thing or two. We took two very different approaches with our carving methods. I assumed that the pineapple would be very difficult to carve compared to a pumpkin so I went with a very simple approach. I created a pattern by cutting out individual diamond pieces from the pineapple. I just used a steak knife and found the pineapple surprisingly easy to cut through. In the end, my pineapple looked like a cool little lantern (but not really like a Jack O' Lantern since it was missing a face). Next year, I think I'll be a little more brave and will try out a more complicated design. Greg was very ambitious with his carving endeavors. He created a print-out of the Bride of Frankenstein and was planning to transfer the design onto the pineapple by creating little pin-prick trace marks through the paper (like he usually does with pumpkins). This was mistake #1. Because the pineapple has such a crazy texture, it's impossible to see the design when you "draw" it this way. Instead he had to use a black marker to freehand sketch the design. Mistake #2 was assuming that the pineapple could be carved partially. With pumpkins you can cut halfway through the rind and still see the glowing candle through the skin. Greg used a Dremel to try to achieve this effect...and it didn't quite work out. It was a mess - pineapple flying everywhere - and the texture of the pineapple itself doesn't help with this sort of design at all. In the end, his pineapple looking frightening...but nothing like the Bride of Frankenstein. Lessons learned! Know that you'll have to draw any designs on the pineapple with a dark marker and that using a steak knife with standard cutting techniques yields much, much better results than a complex Dremel design. 8. Light Up Your Pineapple Jack O' Lantern! Place a tea light candle at the bottom of each pineapple and use a long lighter to light. Place the tops on, and voila, you're done. Stand back and enjoy your handiwork! We had fun with this project and can't wait to try out some new methods and designs next year! And if you ask me, I think my little lantern could be a nice decoration year round! Has anyone else out there carved pineapples before? We'd love to see what designs you were able to achieve! Tiki Mug Monday: Uh Oa!